The spectrum of the hydrogen atom has proved to be the Rosetta stone of modern physics. Hundreds of physics conferences have been held since World War II, but with little doubt, the most influential conference of them all occurred on June 2, 3, and 4, 1947 on Shelter Island at the eastern end of Long Island. This conference occurred soon after physicists had returned from their wartime work designing the atomic bomb in Los Alamos, developing radar systems at MIT, or on other war-related projects in laboratories located around the country. Most of the physicists had returned to their prewar faculty positions and were looking ahead. It was an auspicious time for a conference. The physicists invited to the Shelter Island conference met in New York City on Sunday, June 1 at the American Institute of Physics, boarded a battered old bus, rode across the length of Long Island, transferred to a ferry, and finally arrived at the Ram's Head Inn, where the conference was held. The meeting began on Monday morning with accounts of two recent experiments that reported small and subtle deviations in the energy states of the hydrogen atom. From that point on, the data from the hydrogen atom and their implications were a dominant topic of discussion. With the hydrogen atom, small things are significant. In part, this is because the hydrogen atom is so simple that even a small discrepancy has no place to hide. More to the point, the hydrogen atom is unique in that physicists can apply physical theory to it with exactitude: neither assumptions nor approximations compromise the outcomes of theoretical analyses of hydrogen. Therefore, with precise experimental data drawn from the hydrogen atom, physical theories must provide an accurate account of measured results or else the theory itself must be altered. This is what happened as a result of the Shelter Island conference: the results gave added impetus to the most successful theoretical framework physicists have produced, quantum electrodynamics (QED). The modern QED framework has shaped large bodies of physical research ever since the Shelter Island conference. June 2, 1947 were tantalizing because of their accuracy and pro-vocativeness. These data revealed small shifts in the energy states of the hydrogen atom, thereby adding further to the observed spectroscopic details of the hydrogen atom. The evolving spectrum of hydrogen demonstrates the way experiment and theory goad each other and, in the process, provides a telling example of how great science advances (see Figure 15.1 below). At the turn of the century, the Balmer spectral series provided physicists with hard data that cried out for explanation either in terms of some established "gear works" or some less familiar dynamics working within the hydrogen atom. In addition to the four Balmer lines—Ha, H^, Hy, and H—was the discovery by A. A. Michelson in 1891 that the spectral transition Ha was a doublet; that is, it consisted of two closely spaced lines. These two Ha lines were so close together that the Michelson interferometer, a high-precision optical instrument, was required to observe it. 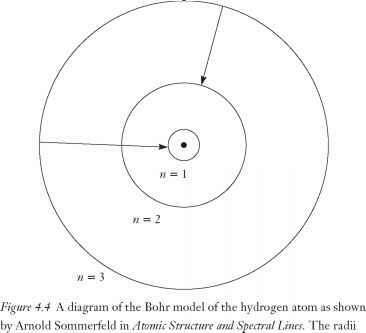 In 1913, Niels Bohr developed the first compelling model of the hydrogen atom. In this model, Bohr supplied the dynamics that were indeed "less familiar." Bohr adopted a quantum condition when he assumed that the hydrogen atom could exist only in certain energy states or levels. In other words, Bohr assumed that energy was quantized. The Balmer series of spectral lines, as well as additional spectral series, resulted from transitions between these fixed energy states. Bohr's model successfully accounted for the gross features of hydrogen spectra. It failed to account for the doublet nature of the Ha spectral transition. Arnold Sommerfeld, in 1916, set out to explain the finer details of the hydrogen spectrum. To do so, he refined Bohr's model by adding the possibility of elliptical orbits to the circular electron orbits Bohr had assumed in his model. This step alone, however, was not enough as the energies associated with the elliptical orbits were the same as those associated with the circular orbits. These elliptical orbits, however, did take the orbiting electron on a wild ride within the hydrogen atom as the electron swept closer to and roamed farther from the nuclear core than was the case with Bohr's circular orbits. It was when Sommerfeld brought relativity theory to bear on the issue that Bohr's energy states were split into additional energy states clustered closely together. This opened the way for additional spectral transitions that explained hydrogen's fine structure and brought experimental data and theory into harmony. However, in spite of this agreement, Bohr's model and Sommerfeld's extension of that model were ad hoc in character; that is, both were based on assumptions specifically made to account for hydrogen's spectral lines and thereby neither emerged out of a theoretical base of established general validity. The creation of quantum mechanics in 1925 by Heisenberg and in 1926 by Schrödinger did provide a firm theoretical basis for the quantum nature of the hydrogen atom. Bohr's quantum condition was no longer ad hoc: quantization became a natural consequence of the wave-particle nature of the electron and all other subatomic particles. But neither Heisenberg's nor Schrö-dinger's quantum mechanics provided an adequate account of the details of the hydrogen spectrum. To explain the spectrum of the hydrogen atom, all the facts had to be known and the power of both quantum mechanics and relativity theory were required. Neither version of quantum mechanics—Heisenberg's nor Schrödinger's—incorporated the theory of relativity. Neither Heisenberg's nor Schrödinger's quantum mechanics embraced the spin of the electron—a basic property of the electron discovered after Heisenberg and before Schrödinger did their seminal work. In 1928, Paul Dirac brought quantum mechanics and relativity together and, in the process, provided a solid theoretical basis for understanding the spectrum of the hydrogen atom. He made no assumptions, working from the firm footings of quantum mechanics and relativity theory. His work not only gave a complete explanation of the hydrogen spectrum, but also accounted for the spin of the electron as well as the electron's magnetic moment. Figure 15.1 The energy states of hydrogen according to Bohr, then Sommerfeld and Dirac, then Lamb (left to right). The left-hand column shows the energy states that resulted from Bohr's 1913 model of the hydrogen atom. Each state is labeled by the principal quantum number, n. The lowest energy state, n = 1, is called the ground state of the atom and is the state normally occupied by the atom. The ground state determines the physical size of the atom. States with higher energy are labeled by n = 2, n = 3, and so on. Transitions among these states are the origin of hydrogen's spectrum. The middle column shows the changes that result from relativistic and magnetic effects. The states are lowered in energy and additional energy states appear. Transitions among these states give rise to the "fine structure" of hydrogen's spectrum. Sommerfeld accounted for this complication, but his approach now has only historical interest. Dirac provided the correct explanation of these energy states by combining quantum mechanics and relativity theory. The right-hand column shows the departure from Dirac's theory that resulted from Lamb's experiment. The separation between the 2S\n and 2Pi/2 states is called the Lamb shift. This energy-state splitting prompted refinements in quantum electrodynamics. Not drawn to scale. tron's spin and the attending magnetic moment, which interacts with the magnetic field generated by the relative motion between the charged electron and proton.) The five spectral transitions allowed between these five energy state levels are so close together in wavelength that in 1928 they could not be observed individually; rather, a doublet—two spectral lines—was observed for the Ha transition. In 1938, new experimental data hinted that a small discrepancy might lurk in the spectrum of hydrogen. In Dirac theory, there are three energy states associated with n = 2, labeled 2S1/2, 2P1/2, and 2P3/2. But in Dirac theory, the 2S1/2 and 2P1/2 levels have the same energy. Two states with the same energy are called degenerate states. The new data, from experiments by W. V. Houston and R. C. Williams, hinted that these two degenerate states might, in fact, have slightly different energies.4 Such a result would be at odds with Dirac theory. Other physicists obtained experimental results that appeared to be consistent with Dirac theory; that is, they observed each level as having the same energy. When World War II brought such experiments to a halt, the data were not conclusive. Dirac theory still seemed adequate and survived the war years intact. The two reports that started the deliberations of the Shelter Island Conference in 1947 and dominated much of the ensuing discussions were given by Willis Lamb and Rabi. Both reports brought fresh data to the participants, data laid bare by the technology that came out of World War II. In the process, Lamb and Rabi exposed the possible discrepancy in Dirac theory that laid dormant throughout the world conflict. In the twentieth century only a few practitioners excelled in both the theory and practice of physics. Willis Lamb was one of these. As an undergraduate chemistry major at Berkeley, Lamb came to recognize that it was theoretical physics that most interested him. He remained at Berkeley, but switched to physics upon entering graduate school. Eventually, he wrote a theoretical dissertation under the direction of J. Robert Oppenheimer. Soon after his formal education ended, the war came and Lamb, who had accepted a position at Columbia University, was recruited by the leaders of the radar project. Since the MIT Radiation Laboratory had a satellite laboratory at Columbia, Lamb stayed there. Lamb's Rad Lab assignment was to design, build, and test magnetrons with the objective of creating short-wavelength versions of the ten-centimeter device that had come from England and had started the radar initiative. In this capacity, Lamb honed his experimental skills. When the war ended, the microwave instruments created for war use awaited peacetime applications. The hydrogen atom is the simplest one in existence, and the only one for which essentially exact theoretical calculations can be made on the basis of the fairly well confirmed Coulomb law of interaction and the Dirac equation for the electron. Such refinements as the motion of the proton and the magnetic interaction with the spin of the proton are taken into account in rather approximate fashion. Nevertheless, the experimental situation at present is such that the observed spectrum of the hydrogen atom does not provide a very critical test either of the theory or of the Coulomb law of interaction between point charges. A critical test would be obtained from a measurement of the fine structure of the n = 2 quantum state. Figure 15.2 The experiment that led to the discovery of the Lamb shift, as Lamb represented it in his Nobel Prize address. A beam of hydrogen atoms was directed from the source of the atoms (S) to a detector (D). In between, two regions were traversed by the hydrogen atoms, a bombarding region (B), and a magnetic field and RF region. Not drawn to scale. two n = 2 energy states to determine whether their energies were identical or very slightly different. There is an elegance and beauty to Lamb's experiment. In his experiment, shown in Figure 15.2 as Lamb represented it in his Nobel Prize address, a beam of hydrogen atoms was directed from the source of the atoms (S) to a detector (D). In between, two regions were traversed by the hydrogen atoms. The first region was a bombarding region (B), where electrons collided with the hydrogen atoms. The purpose of the bombardment was to excite a small fraction of the hydrogen atoms from their ground level, n = 1, to a higher energy level, n = 2, which was the state of interest. It so happens that one component of the n = 2 state, the 2S1/2 state, is a metastable state, which means that it has a relatively long life before decaying back to the 1S1/2 ground state. Lamb exploited this long-lived property, which allowed hydrogen atoms in this critical state to get through the apparatus and be detected before it decayed back to the ground state. After the hydrogen atoms were bombarded, they passed through a region where they were subjected to both a magnetic field and radiofrequency (RF) radiation, which, in combination, were designed to seek out the suspected energy discrepancy by stimulating transitions directly between the two close-lying states. With hydrogen atoms in the desired n = 2 state moving through the apparatus, Lamb varied elements in the RF box to induce transitions directly between the metastable 2S1/2 state and the 2P1/2 state, the two states suspected of having different energies. If true, transitions would be induced between them and, once in the 2Pm state, the atom would immediately decay to the ground 1 S1/2 state, with an attending decrease in the signal seen by the detector. That is exactly what happened. At a particular RF, the detector signal decreased. Knowing the RF, the energy difference between the 2S1/2 and 2P1/2 states was determined. The experimental result was unequivocal: there was an energy difference between two states that could not be accounted for by Dirac theory. 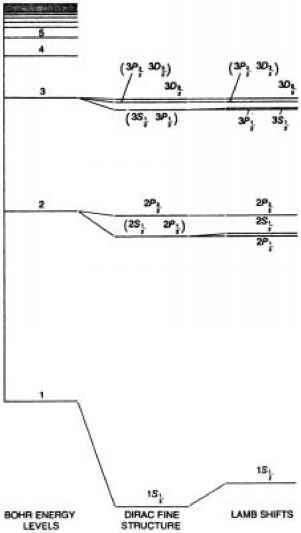 The new energy states for n = 2, according to Lamb, are shown in the right-hand column in Figure 15.1. The separation between the two levels is called the Lamb shift. What is the significance of the Lamb shift? The Balmer lines arise principally from the electrical interaction between the positively charged nucleus and the negatively charged electron. The fine structure as described by Dirac theory arises from relativistic effects. The Lamb shift is explained by QED. The explanation of the Lamb shift by means of QED is, as might be expected, rather subtle. The electromagnetic field must be expressed in quantum terms. Within the context of a quantized electromagnetic field, the complete explanation takes into account at least four factors. First, the electron interacts with its own electromagnetic field, which modifies the electron's magnetic moment (to be discussed in Chapter 16). Second, photons associated with the elec tromagnetic field can spontaneously produce pairs of electrons and positrons in the neighborhood of the nucleus. These negatively charged electrons together with the positively charged positrons effectively polarize the space surrounding the nucleus and shield the hydrogen's electron from its nucleus. Third, fluctuations in the vacuum surrounding the electron can alter its motion and its kinetic energy. Finally, there may be corrections involving the proton's size, charge distribution, mass, and motion. QED puts these elements together in a consistent way and provides a very accurate account of the Lamb shift. To appreciate the power of QED, consider the fact that the measured frequency of the spectral transition between the two levels resulting from the Lamb shift is 1,057.845 MHz and the value calculated from the basic equations of QED is 1,057.853 MHz. Experimental measurements and theoretical calculations agree to within ten parts per million. Years later, when Willis Lamb celebrated his sixty-fifth birthday, Freeman Dyson wrote to him: "Your work on the hydrogen fine structure led directly to the wave of progress in quantum electrodynamics. . . . You were the first to see that that tiny shift, so elusive and hard to measure, would clarify in a fundamental way our thinking about particles and fields. "5 Dyson's remark, made in 1978, confirms Rabi's judgment of the Shelter Island conference thirty-one years earlier as "the starting point of remarkable new developments." One of these remarkable new developments was the full development of QED, which has become the paradigmatic theory of physics. Another one of the "remarkable new developments" was in response to the second report that started the Shelter Island conference: Rabi's report of new data on the hydrogen energy states. But that is a subject for the next chapter.